Pickstock Homes is an authorised agent of the Government’s Help to Buy scheme operating in England and Help to Buy Wales. We can offer advice on both schemes, so get in touch if you have any questions. Here is a brief overview of how the schemes work. With a minimum of 5% deposit you will be eligible to receive an equity loan of 20% from the Government, this enables you to secure a mortgage on a new build home of up to 75%, qualifying you for some of the best rates available. The equity loan is interest-free for the first five years. At Pickstock Homes we have undergone full training to ensure that we are equipped to offer our clients the best service and advice, let us guide you through the process of buying your dream home. 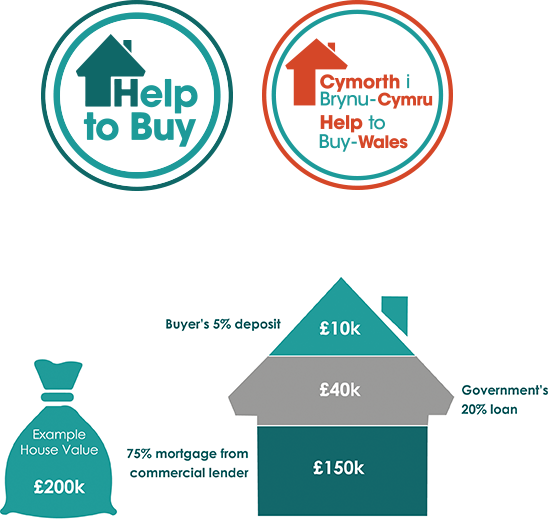 For more information on Help to Buy Wales Click Here to view an information brochure. To find out more about the Help to Buy scheme in England Click Here. Is Help to Buy only open to first time buyers? No, the scheme is also available to people who already own a home but are struggling to raise the full deposit to move house. Is Help to Buy available in Wales? Yes, in January 2014 the Welsh Government introduced Help to Buy Wales, available on all new homes in Wales up to £300,000. Is there a cap on the value of a house you can buy through the scheme? Help to Buy is available on new houses up to £600,000 in England and up to £300,000 in Wales. What is the schemes repayment structure? The 20% equity loan from the Government is interest free for the first five years. From the sixth year a fee of 1.75% is payable and will rise annually by RPI inflation plus 1%. You can repay the loan at any time within the first 25 years (or the terms of the mortgage), or when you sell the property. When does the Help to Buy offer end? Help to Buy Wales is set to end 31 March 2016.